The disturbing, but not very surprising element in their report was to attribute the development of beer making technology to the far-off Sumerians. Several years earlier, the earliest known evidence for the grape wine making technology found at Godin had also been duly contributed to the Sumerians. For the past three generations archaeologist have been excavating from Kurdistan the evidence for the invention and development of some of the most crucial technologies that transferred man-the-hunter into man-the-farmer and eventually man-the-civilized. As if the Kurdish mountains and its inhabitants not being suitable place and people to have been the original developers of those technologies despite the clear archaeological evidence, almost instinctively the archaeologists have been uneasy to contribute any thing original found in there to its native people. They have instead looked for an outside source of influence, at times desperately, and when not found, they have tended to list the originating culture as unknown. The same evidence found in any one of the other loci of civilization like Mesopotamia, Egypt, or Greece are automatically attributed to those cultures until proven otherwise. The treatment of the cultures of the Kurdish mountains has been and remains the reverse. The irony is that as in the case of these most recent discoveries, the argument supporting the Sumerian involvement, is based on evidence that is later in date and indirect in nature (i.e., from the seal impressions) than the Kurdish hard evidence of the actual fermentation vats complete with dried up calcium oxalate sediments (beer residue). In fact Michel et al, indicate that the carbonized remains of the barley used for preparation of the drink was also found first at Godin, just as they admit is the evidence for grapes used for wine making. Let us thus briefly take a closer look at the archaeological evidence as well as the relationship that existed between Zagros mountain societies and the Sumerians to see where the direction of influence must have been, and how. Godin by no means is an odd incidence of technological sophistication in an otherwise culturally and technologically barren region to lead to require a search for an external civilizing influence. The mound of Godin (or Gawdin) is in fact located in one of the world’s richest archaeological regions, stretching for one hundred miles from Shahabad to Hamadan, where the task for any archaeologist is not where to excavate, but which one of the hundreds of mounds, temples, palace complexes and cave habitats to choose. Here one finds some of the earliest evidence of mankind’s domestication of cereals (e.g., barley and wheat) and live stock (e.g., goats and sheep) and development of some of the other basic technologies dating to 11,000 years ago (Braidwood et al, 1960). Additionally, within this very same region is found the remains of the world oldest glazed pottery at Seh Gabi (Levine, 1974; Vandiver, 1990), earliest experiments with writing and accounting at Godin and Ganj Dara (Schmandt-Besserat, 1986; Nissen, 1986; Green, 1981) and now wine and beer. Godin itself turns out to have been a major city with well planned and solidly built buildings and a contemporary of the oldest cities of Sumeria and Akkadia, and at a time when most of the rest of the world lived in caves. Godin today can be seen as a great mound on the eastern horizon if one stands on the imposing remains of the 2300 years old grand staircases and the vast colonnaded temple platform of the goddess Anahita at Kangawar. This entire archaeological region straddles the old Silk Road which was pre-dated for thousands of years by other crucial commercial arteries of the ancient world that connected the East to the West over the Iranian plateau, lowland Mesopotamia, and the Levant. As such, the region boasted a commerce oriented civilization that exported many of its technological developments and discoveries and now contains the remains of many imported artifact and raw material from far away sources and cultures of the time. About 4,500 years ago this region served as the heartland for the native empire of the Qutils (or Gutis) who were among the Hurrian ancestors of the modern Kurds before their Aryanization in the hands of the immigrating Indo-European tribes such as the Medes, Sagarthians, and the Scytho-Alans. The Quti military might soon expanded from the Kurdish mountains and their capital of Aratta to subdue every neighboring regions including Sumeria and Akkadia. In light of the discovery of many well-constructed buildings, wealth of artifacts and new technologies, Godin is the strongest candidate for the site of ancient Aratta. A Qutil general named Merkar declared his independence from the mountain domains of the Qutil Federation whose king happened to be Merkar’s own brother. Breaking with Aratta, Merkar established circa 2500 BC a separate dynasty to rule independently over all of the Sumerian and Akkadian city-states, taking the famous Uruk (Erech-Kullab) of Gilgamesh for his capital. By 2250 BC the Qutils had totally annexed Sumeria and Akkadia, ruling them until 2120 BC. During that 130 years the Qutils actually settled and flourished in Sumeria in large numbers, populating for example, the twin city of Kesh-Adab (Kramer 1987). Conversely, there has never been any evidence for the Sumerian power to have expanded, let alone engaging in large-scale settlment in any part of the rugged Kurdish highlands. It is absolutely extraordinary that the tablets recording the correspondence between the Qutil ruler in Aratta and the rebellious Merkar (who was commonly known as Enmerkar, after he took up the Sumerian royal title of En) has survived to this day. These now constitute some of most valuable written records for the history of the Kurdish highlands of circa 4500 years ago. Samuel N. Kramer, arguably the foremost Sumerologist has fortunately translated these correspondence (Kramer, 1987), which established for a good deal of close commercial, artisitic and political contact between Aratta and Uruk, and in none of them is there a hint that the society at Aratta (Godin?) was any less sophisticated or looked down upon by the now all-famous Uruk of Sumeria. In fact, Kramer shows that it was Sumeria which needed the help from the Arattan architects, decorators as well as raw material to build its temple of Innana in 4500 BC! Whereas Kurdish mountains are the natural habitats of wild barley, wheat and many other cereals, and the evidence points at their earliest domestication there and not to Sumerian marsh lands and deserts where domesticated cereals were introduced much later from the highland, it is only logical to believe that the fermented product of barley, that is beer, to have been also introduced there from the highlands. This recent archaeological evidence just fortifies the common logic. In fact the beer and wine discovered at Godin date to this exact time period, and could have been introduced by the Qutils into Sumeria where later and indirect evidence (in form of seal markings showing people drinking beer through a straw from a common vat) is found. In fact the Sumerian tablets also record another introduction into Sumeria by Enmerkar the Qutil: worship of the bird-god Anzu, which surprisingly is still worshipped by the Yezidi Kurds as the bird-icon, Anzul (or Anzal). The strong but totally unjustified hints by the Michel group at Sumerian origin for the Godin beer technology prompted the New York Times to carry an article in the same week, squarely attributing the invention of beer (and grape wine) to the Sumerians, with not a word of the Kurdish mountains in Iran, deep inside which, the actual discovery had taken place. The New York Post carried a cartoon the following day after the New York Times, showing a beer guzzling “Sumerians” in ancient Egyptian costumes (?! ), with a banner over their heads declaring “Iraq’s Best Beer”! 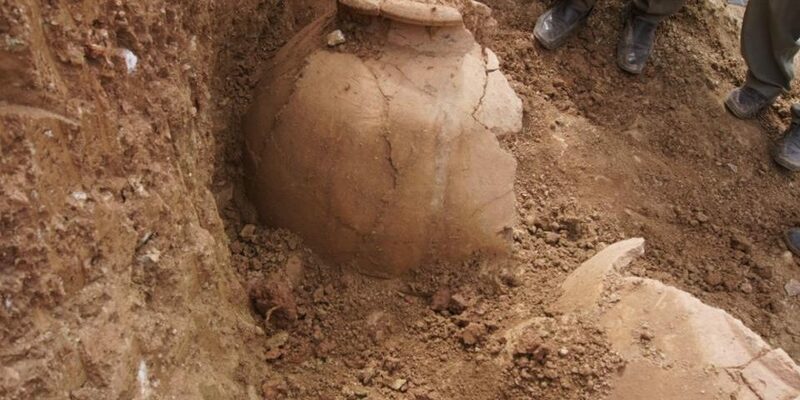 Postscript: In 1996, at the 7000-years-old site of Hajji Firuz, between Mahabad and Shnu in eastern Kurdistan, Iran, was found by Patrick E. McGovern and the same team from the University of Pennsylvania Museum, even anolder evidence for wine making in Kurdistan and the world (Archaeology, 10/1996) Six jars, each two-and-a-half gallon in capacity, found in the kitchen areas of a house at Hajji Firuz, contained chemical evidence of a well-developed grape wine making industry. Using infrared spectrometry, liquid chromatology, and a wet chemical test, was found calcium salt from tartaric acid, which occurs naturally in large amounts only in grapes. Resin from the terebinth tree was also present, presumably used as a preservative, indicating that the wine was deliberately made and did not result from the unintentional fermentation of grape juice. Grapes still grow wild at that and other parts of Kurdistan. Meanwhile, grape presses made of stone and dated to the late third millennium BC have been recently found at Titris Hoyuk, south of Adyaman in western Kurdistan, Turkey. Wine–that “beverage of the gods,” seem now to have been invented and improved by the ancestors of the Kurds. Sources: Braidwood, R. et al, “Seeking the World’s First Farmers in Persian Kurdistan: A Full Scale Investigation of Pre-Historic Sites near Kirmanshah,” Ill. Lon. News (October 22, 1960); Levine, L.D., “The Excavations at Seh Gabi,” Proceedings of the 3rd Annual Symposium on Archaeological Research in Iran. (Chicago, 1974); Vandiver, P., “Ancient Glazes,” Scientific American 262:4 (April 1990); Schmandt-Besserat, D., “An Ancient Token System: The Precursor to Numerals and Writing,” Archaeology (November/December 1986); Nissen, H., “The Development of Writing and of Glyptic Art,” in U. Finkbeiner and W. Rölling, eds., Gamdat Nasr: Period or Regional Style? (Wiesbaden: Reichert, 1986); Green, M.W., “The Construction and Implementation of the Cuneiform Writing System,” Visible Language, xv.4 (1981); Kramer, N., “Ancient Sumer and Iran: Gleanings from Sumerian Literature,” Bulletin of the Asia Institute, I (1987).